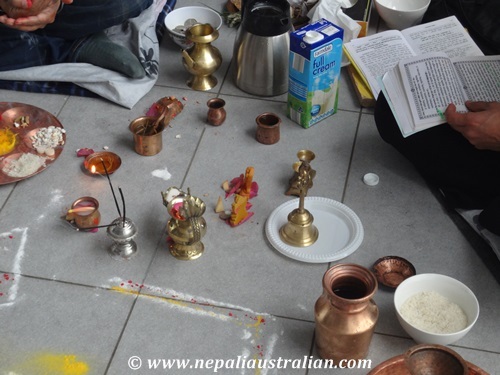 As Hindus, we do a puja and blessing for everything in life so when we move to our new place, we need to perform a puja too. 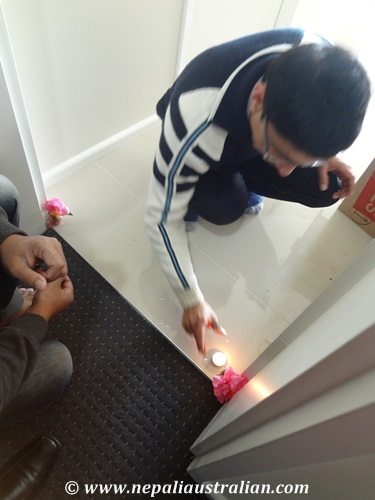 Before entering a new house, a ceremony known as Griha Pravesh ceremony is performed. 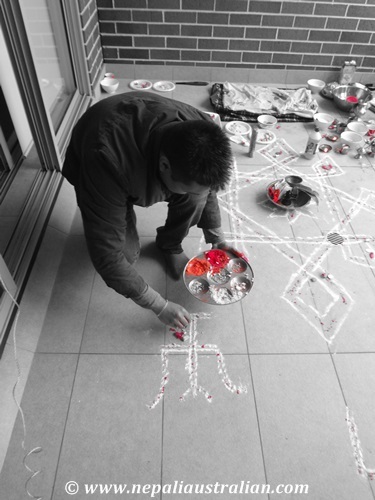 Griha means house and pravesh means entry in Sanskrit so this puja is house-entry puja. 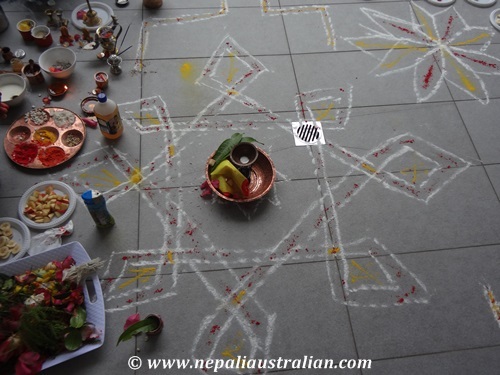 Generally, in Nepal once the house is ready to be moved into, the family moves in on an auspicious day that is determined by the astrological charts by a priest. But for us, we had to move into our new place according to our contract so we decided to do it on the first day when we were going to spend the night there. We had a priest who is a friend of my cousin and he offered to do our Griha pravesh puja. It was a very simple puja. 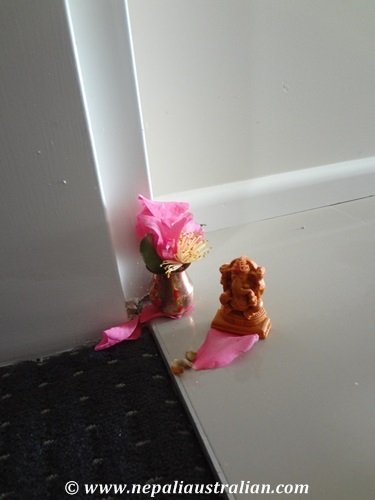 The priest put two pitchers on either side of the main door then he put the idol of lord Ganesh on the doorway. He said some mantras blessing us and the house and then we just offered Sindoor, rice and flower first to the Lord Ganesh and then to the pitchers. Also we offered some coins and then lit some tea light candles. After that he went through all the rooms and sprinkled some water all around and blessed each room of our place. After that we established the idols we had brought from our old apartment and lit a candle for the gods. As a part of moving into a new place, we needed to turn on the stove and cook something. As we hadn’t unpacked properly, we didn’t have anything to cook so we just boiled water and made coffee and offered to all present. 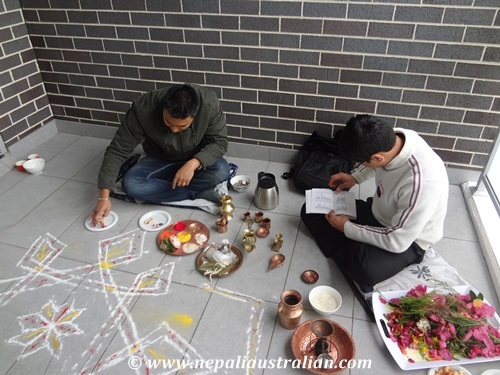 Rudri Puja is an ancient practice followed by Hindus to bless the house once you move in. Rudri is also done on many other occasions like beginning new things like business , marriage, job etc. ‘Rudri’ means ‘Shiva – the Benevolent’, ‘ the Destroyer of Evil’ and ‘Puja’ means that which is born out of fullness. Through this Puja one can aim for inner peace and fulfilment. In this Puja, Lord Shiva is worshipped in his Rudra form. The reason Rudri puja is done because the world is a play of energy: negative and positive. When we pray to Shiva – the Lord of transformation – the entire negative energy around us in form of disease, depression, and unhappiness gets transformed into peace, prosperity and joy. Then peace surrounds us in body, mind and soul. For the puja, the priest gave me a list. Here is the list if anyone wants to do the puja.There are still few stuffs missing but most of them are in the list. There were many things to be bought but we are lucky that we have Nepali stores here so I went there and bought most of the stuff from there. So on the day of the puja, I woke up early and had a shower, wore my fresh Sari and went straight to prepare for the puja. I made sure everything the priest asked were in order so when he comes in , the puja can be started straight away. AS also had a shower to cleansed himself as he would be sitting for the puja. Neither AS or I were to eat or drink before the puja. Then I made apungo ,halwas and Kheer for Prasad . In the meantime, the priest came and started making different mandpas on the floor. 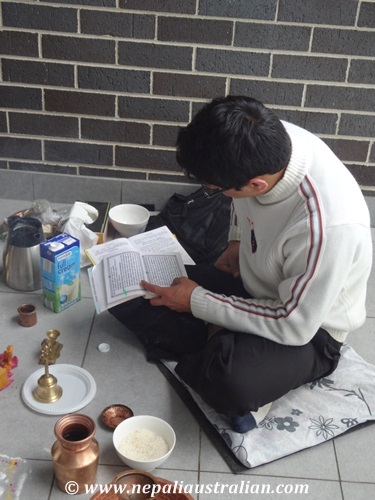 He told us that it would take 3-4 hours for the puja and AS would be sitting on the puja with him the whole time while I would be be called as required, which was a good things as I had so much to do in the kitchen. 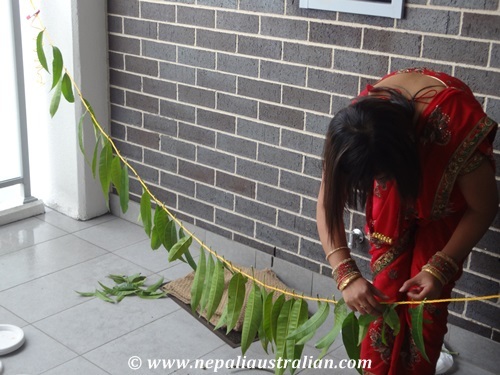 So while they were doing puja, I tried to prepare other stuffs like cuts the fruits for puja and make the mango leaf garland to put on the door. 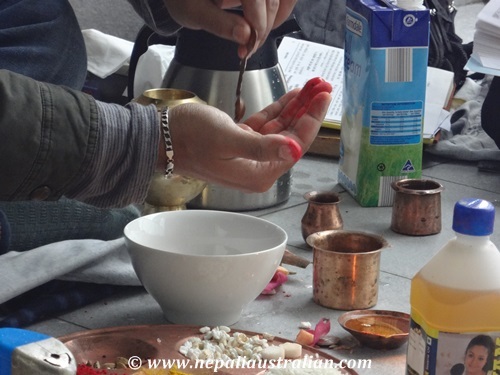 Each ancient mantra that is chanted gets absorbed in materials like curd, milk, ghee, honey etc. 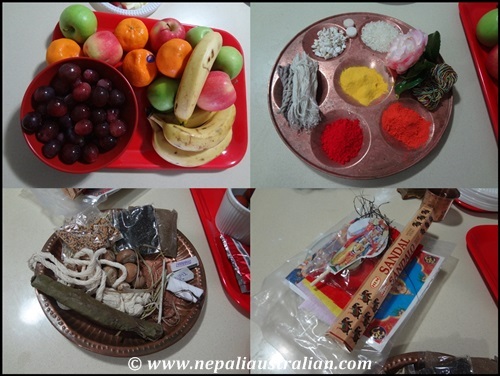 which are used as offerings in the Puja. It is then offered to Lord Shiva with reverence, love and gratitude. The chanting of the mantras is so pure and meditative that it takes one to a different place. 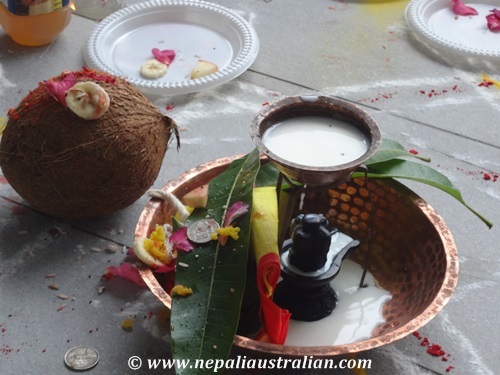 This puja was performed with a Shiva ‘linga’ that we had brought from Pashupatinath temple from Kathmandu. I am sure lots of things were done in the puja which I missed but here are some of the pictures of the day. I was called twice during the puja to do some praying and blessing. 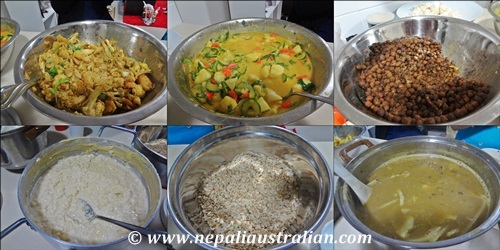 In the meantime, with the help of my cousin and my friend we cooked food for the guests. I had around 25 people invited to share the day with us. The food for the day had to be pure vegetarian with no meat, no onion, no garlic and no tomatoes. So we cooked Chana (chick peas), aloo tama, aloo ko achar, cauli aloo . Then we had Kheer, sweets (lal mohan and rash bhari) and yogurt for dessert. It was not an easy task to cook without onion, garlic or tomatoes but it was accomplished and if I say so myself, it was quite tasty. Therefore, by the time the puja was over, the food was ready. 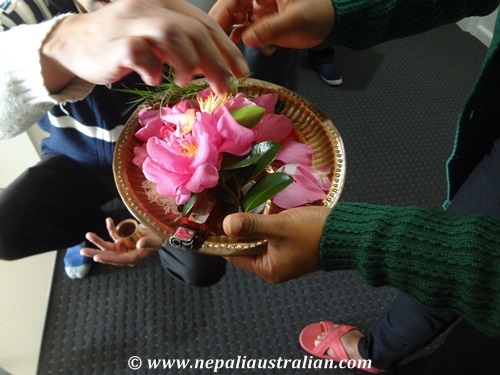 Once the puja was over, the priest put tika on the foreheads of everyone present then AS put tika on the the small kids. 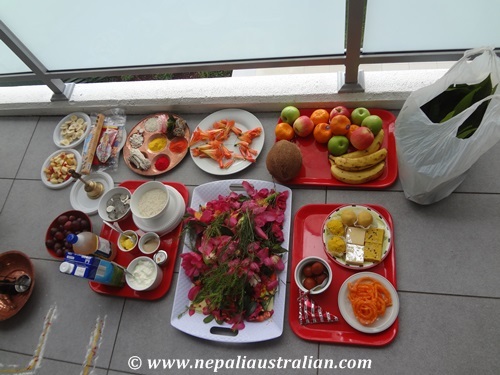 As my parents were not here, my brother and sister in law prepared sagun for us and brought some fruits and clothes. 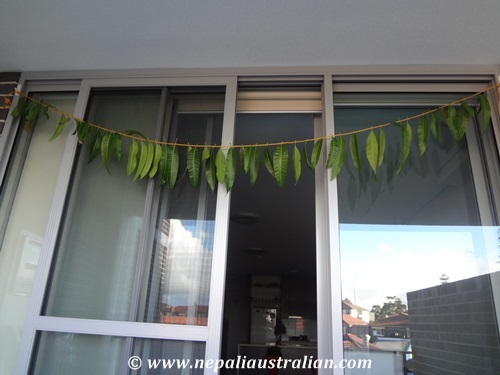 Then AS hung the mango-leaf garland on the door. After the initial process, it was pass mid-day. AS and I had been fasting since the morning so when the puja finished, we were allowed to eat. Everyone including us enjoyed the food and the puja was concluded. 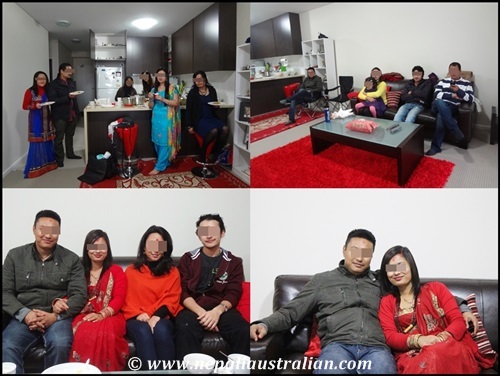 We had visitors coming throughout the day from morning to evening but we are just happy that there were so many people here for us to share our happiness with. 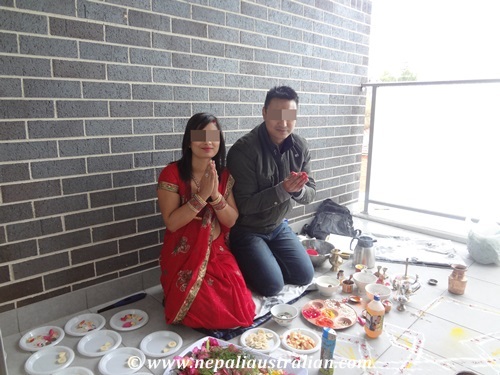 In addition, I am happy that we were able to perform the puja and get blessing even though we are so far from the Nepal. Both our parents are really glad that we could follow our tradition and culture with our new place too. Happy weekend everyone and Happy 4th of July to everyone in US. 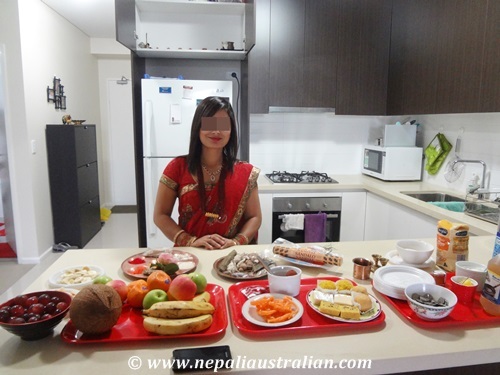 This entry was posted in Australia, Nepali Culture, Nepali food, Newari Culture, Personal and tagged Griha pravesh, hindu, hindu house warming, Hindu puja, how to do Griha pravesh, How to do rudri puja, Lord Ganesh, Nepal, Nepali priest, pandit, priest, rudri puja, shiva puja, tea light candles, things to buy for rudri puja, what do you need for rudri puja. Bookmark the permalink. Amazing response specially the image factors. So beautiful and especially informative to those who may not know these things about your culture and beliefs. Blessings to you and your new home, too. May be you can write one more post regarding your journey & emotions you guys went through while getting this new place. Thank you. 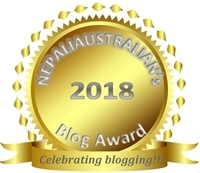 So when are you going back to Nepal? Congratulations on your new place. 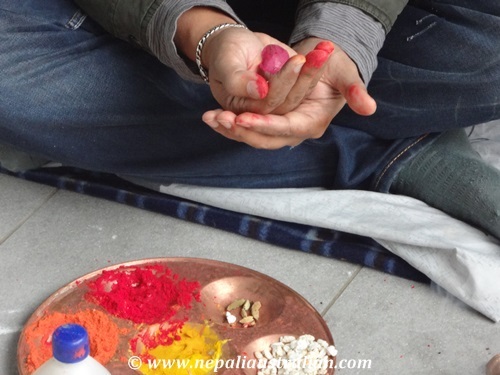 Doing puja is now something familiar to me, so it was nice to see your photos. The food looks amazing and your sari is gorgeous too! I love that you honoured the tradition – ahd shared it with us. Wonderful. Lovely.Beautiful photos and yummy foods too..May Your life be blessed with happiness and prosperity..Congratulations!! !